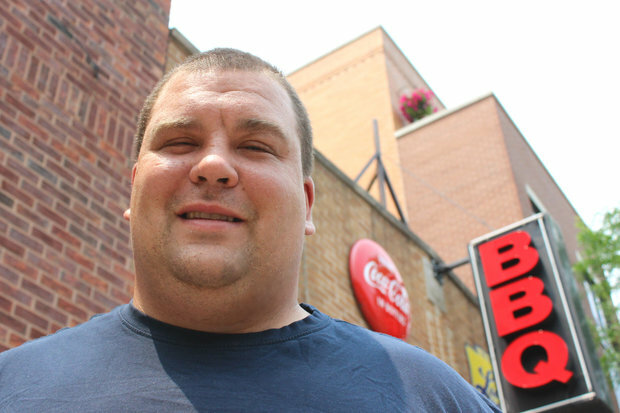 NORTH CENTER — Why would North Center's newest barbecue joint take a pass on Ribfest, the neighborhood's, nay, the city's, biggest celebration of smoked meats? "We didn't have our business license in time," explained Chris Bogyo (rhymes with mojo), owner of Mr. B's BBQ, which softly opened May 1. Bogyo hopes to make a splash at this weekend's fest anyway. After all, Mr. B's will be nearly impossible for festivalgoers to miss — its address, at 4160 N. Lincoln Ave. in the old Smokin' Woody's space, is just steps from the entry/exit point at Berteau Avenue. For those familiar with Smokin' Woody's, Bogyo stressed that he didn't merely slap a fresh coat of paint and new sign on the building. "I didn't want to take over a place and just continue their thing," he said. "I knew I could do better." 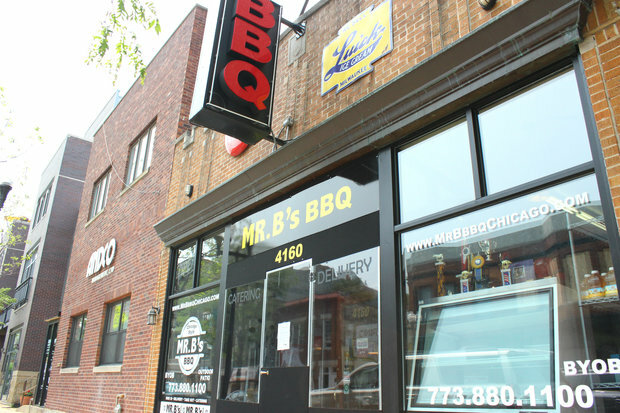 His rubs — mixes of 24 spices for pork and chicken, 21 for brisket — are "100 percent my creation" Bogyo said, and are concocted especially for Mr. B's by Epic Spices in West Town. Aside from the salad dressings and sausage, everything else on the menu at Mr. B's is made in house, from the potato salad to the baked beans. "I want to give our customers that homemade-with-love feel," he said. A graduate of Le Cordon Bleu, Bogyo earned his BBQ bona fides entering competitions with his younger brother Greg, a Chicago police officer, as members of the Kansas City Barbecue Society. For their first contest back in 2010, the Bogyos pulled up to the event hauling seven Weber grills, most of them salvaged from Dumpsters. "Other people were there with $12,000 smokers," Chris recalled, but the brothers weren't intimidated. "It's not the smoker, it's the person behind it," he said. Bogyo said he was drawn to barbecue because of the patience required. "A steak, you cook it for 10 minutes and it's done. A pork shoulder, you're cooking it for 12 hours," he said. "It's a challenge to yourself, it's a challenge to the meat." For the past two years, Bogyo, who most recently worked at City Winery, had been looking for an opportunity to take his backyard BBQ skills to the next level. When he saw Smokin' Woody's listed for sale on Craigslist, his search was over. "Some days it's like, 'Oh my god, what did I get myself into,'" Bogyo said. Other days, when Mr. B's receives a positive Yelp! review or a customer compliments the chef, Bogyo is reminded, "Oh yeah, this is why I opened a barbecue restaurant." Greg pitched in on rehabbing the space and jumps in on the smoker when he can. Chris's wife Nicole, a pre-school teacher, often works the cash register, and Bogyo's dad can be found at Mr. B's every day. "He's my dishwasher," Bogyo said. "He gets on the meat in the morning. I have a lot of support." The biggest adjustment for Bogyo since making the leap from amateur to professional pit master has been adjusting his recipes for diners' palettes versus competition judges'. "Our whole premise for competition was trying to get as much flavor into one bite" for judges, he said. "I'm learning to taper that back for the restaurant." Bogyo hasn't completely forsaken his competitive BBQ roots, though. A photo of those first seven Webers hangs on the wall inside Mr. B's and the menu item Bogyo's Mojo (their team name) replicates Chris and Greg's competition platter: two pounds of meat that includes one-quarter slab ribs, brisket, pulled chicken and pulled pork. "I wanted to incorporate it," Bogyo said. "It's a big reason why we're here."